Vodafone India, committed to supporting the Government’s bold step to accelerate India’s progress into a less cash economy, today announced a unique cash out facility for its 8.4 million plus Vodafone M-Pesa customers who can withdraw cash using their digital wallet from any of the over 120,000 Vodafone M-Pesa outlets across the country. From digital wallets bringing up more merchants online to banks declaring turning villages into digital economies, solutions have started being implemented. 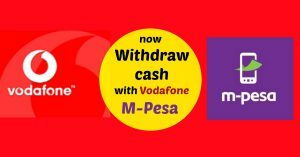 Unlike Paytm wallet, Vodafone M-Pesa is like a banking agent, which facilitates financial services on behalf of others to enable a customer to go to specified outlets and get cash of same worth if they need it. To avail, customers need to carry an identity proof to their nearest Vodafone M-Pesa outlet from where they are able to withdraw money in line with RBI guidelines. 56% of M-Pesa outlets are in rural areas so the impact of demonetisation will be lessened on M-Pesa users. In emerging market like India, where many consumers have access to mobile devices but no access to a bank account, Vodafone M-Pesa enables financial inclusion and offers convenience of a digital wallet for easy transactions, its unique cash out feature enables users to digitise cash, remit it to family and friends, pay bills and/or withdraw it at their convenience.